Thanks to Frode for posting this on Facebook. To Richard Branson from a Virgin airline customer on the Mumbai to Heathrow flight last December. Hilarious. "NVIDIA has created a kit that turns computer screen images 3D provided machines have GeForce graphics processors and one of the new-generation of high-resolution monitors launched at CES by Samsung, ViewSonic, or Mitsubishi. (...) Because the technology works with monitors, 2D computer games can be replayed in three dimensions". AFP article. I want one! and loads of Panadol. "BRITAIN'S estate agents are showing houses to each other in a bid to combat loneliness and prevent their traditional skills from dying out." Another classic from the Daily Mash. Atheist advertising campaign goes global, thousand more buses to burn in Hell! If only more were heeding this message from the American Humanist Association: "Just be good for goodness' sake". A floating city to welcome future global warming escapists? 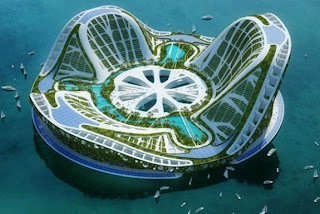 Floating eco-city concept by French architect Vincent Callebaut. The city generates more energy than it consumes through a combination of wave power and solar energy. It can host 50,000 people. No price tag yet but it is safe to assume that it will be used as a luxury development rather than a viable solution for the expected millions of people displaced from their homeland by the rising seas. It looks beautiful though... Article in French in Le Monde. 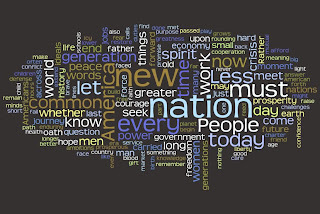 Best Wishes to all my readers.